Filling up at the pump can be a constant drain on your bank account, especially if you own a larger vehicle such as an SUV, drive a lot for your job, or simply enjoy a good road trip! Can credit cards from fuel companies, like Shell, save you money? Below, you’ll find the pros and cons of the Shell Fuel Rewards® credit cards including the main benefits, fees, drawbacks, application process, and more. You’ll also find a few alternative rewards cards that might be worth considering if you’re looking for decent returns on gas. Shell has two store-branded cards issued by Citibank – The Shell Fuel Rewards® Card and the Shell Fuel Rewards® Mastercard®. There is no annual fee for either of these cards but you will note a pretty hefty APR. If you’re approved for a Fuel Rewards® credit card, you’re automatically enrolled in Shell’s Fuel Rewards® program. In terms of Fuel Rewards/savings per gallon, this is applied at the pump. You will see the discount reflected on the screens after you swipe your Shell card. When it comes to your percentage back perks, these are distributed in Shell Rebates and are only applied to purchases made at participating Shell locations. All of these pros and cons, plus more, are discussed in-depth below. The Shell Fuel Rewards® Card is the baseline Shell credit card. You can only utilize this card for purchases at Shell locations, either at the pump or inside the Shell station on non-fuel items. 🏅Instant Shell Fuel Rewards® Gold Status: Gold Status allows members to save at least 5¢ per gallon on every fill-up with any grade of fuel up to 20 gallons. To put things in perspective, the step below this is Silver Status and allows members to save 3¢ per gallon. Silver is the entry level all Shell Fuel Rewards members start at, assuming the member is not a Fuel Rewards cardholder. ⛽️ Save 10 cents per gallon (up to 20 gallons) on every fill-up: This perk is a misleading since this actually incorporates the Gold Status savings Shell already emphasizes as a selling point. When Shell states that you will save 10¢ per gallon, up to 20 gallons, it’s actually referring to the 5¢ per gallon you’re getting from the Gold Status, in addition to the extra 5¢ per gallon, totally 10¢ per gallon, savings you receive for being a cardholder. 10% Shell rebates (up to $1,200 Shell non-fuel purchases): This i benefit applies to non-fuel purchases, at any of the Shell convenience stores throughout the United States. You can find out more about how these rebates are applied below in the “Reward Type Differences” section. The Shell Fuel Rewards® Mastercard® is the highest tier credit card offered by Shell/Citibank. Since this is a Mastercard, it can be used for purchases not only at Shell but also everywhere Mastercard is accepted. 🏅⛽️ The initial three perks (Gold Status, 10¢ per gallon savings, 10% Shell Rebates): These benefits function just as they do for the Shell Fuel Rewards® Card. See the above section for the in-depth explanation of these benefits. 🍔 2% Shell rebates on dining & groceries (up to $10,000): This benefit applies to purchases made at participating merchants. The card’s terms and conditions do not state if this is a U.S. only promotion or applies to groceries and dining outside of the U.S. as well. After you reach the $10,000 limit, you will no longer receive the special rebate offer on these purchases. For more information about the Shell Fuel Rewards Program specifically, see the dedicated section later in this article. Why does a high APR matter? It doesn’t if you’re a responsible cardholder, but if you’re late on payments, miss payments, or pile up a decent balance on the card, the fees will add up quickly making it harder to pay down your balance. The other fees listed above are pretty standard when compared to other store-branded credit cards. Hot Tip: To find out more about what these fees are and how they affect you, check out our definitive guide to credit card fees (and how to avoid them). While the high associated fees can be deterrent enough for some, there are certainly other drawbacks to these Shell credit cards. First, the Shell Fuel Rewards Card can only be used at Shell stations. If you purchase gas at a variety of stations based on what station is offering the best price for gas, this severely limits your spending abilities. Second, while the Shell Fuel Rewards Mastercard can be utilized anywhere, the perks you receive from either card are only beneficial if you spend a lot at Shell since you’re only receiving discounts at the pump, or on non-fuel Shell purchases. It’s recognized that the discount at the pump can be a great way to save money; however, it’s capped at 20 gallons. If your car’s tank is more than 20 gallons, then you’re not getting that discount on your full tank fill-ups. Each card does earn Shell Rebates in a lot of categories and ways, but, as mentioned, the percentage back perks are only applied as a statement credit to purchases made at Shell. This means this program is not truly a cash-back card since these perks aren’t flexible. 0% Intro APR for 15 months from account opening on purchases & balance transfers, then a variable APR of 17.24 - 25.99%. Hot Tip: If you need more card options, we’ve compiled an extensive list of credit cards that reward you for gas purchases. Technically, you can be a Shell Fuel Rewards® member without having either of their credit cards. 🏅Instant Shell Fuel Rewards® Gold Status for 6 months: The details for this perk are a bit convoluted but currently, it appears simply signing up for a Fuel Rewards membership gets you a free upgrade to Shell Gold status for 6 months. Gold Status simply allows members to save at least 5¢ per gallon on every fill-up with any grade of fuel, up to 20 gallons, as long as you swipe your membership card at the pump. In order for basic Fuel Rewards members to maintain their introductory Gold Status, they must fill-up at least 6 times during your 3-month qualification period. This 3-month qualification period is actually the last 3 months of your introductory 6-month instant status period. It’s important to note here that qualifying fill-ups only count if they are at least 5 gallons or more. If you do not qualify to maintain your Gold Status, you will be downgraded to Silver Status. Fuel Rewards members with Silver Status receive at least 3¢ per gallon on every fill-up, up to 20 gallons. Hot Tip: Shell actually has a Gold+ Status but you can’t apply or qualify for it; it’s available by invitation only. Shell states their Gold+ program was created to recognize their best customers and reward them for their loyalty. 🍔Earn 10¢ per gallon Fuel Rewards per $50 spent at participating restaurants, bars, & clubs: Fuel Rewards members, who make purchases at participating restaurants, bars, and clubs and pay with a linked Mastercard®, Visa® or American Express®card will receive this perk. This perk only extends up to 20 gallons. Shell does not require members to achieve the $50 spend threshold in one purchase; members will earn 10¢ for each $50 in purchases accumulated. Additionally, to-go, take-out, and restaurant-operated delivery orders are also applied to your $50 threshold if ordered via a participating restaurant. Lastly, members are allowed to link more than one card. 🏝Earn 5¢ per gallon Fuel Rewards per $50 spent on booking flights, hotels, rental cars, and vacations: To access this perk, members must log into their Fuel Rewards account and click through the website links in order to make their reservations. Like all other rebates, it’s applicable up to 20 gallons. 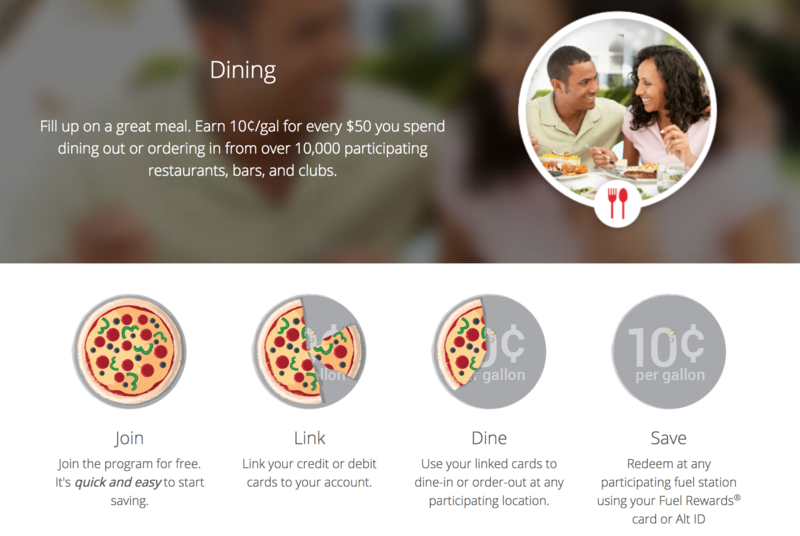 Fuel Rewards does not require members to use a linked credit card to receive rebates for this perk. If you’ve booked a flight, your rewards are awarded the month following payment of the booking. For hotels, they’re awarded no later than 60 days after check-out. For car rentals, rebates are awarded within 45 days after dropping off your rental car. Earn 5¢ per gallon Fuel Rewards per $25 spent on specific purchases at Shell convenience stores: Members can earn additional savings when they purchase specifically marked items at participating Shell convenience store locations. These items will be clearly marked with Fuel Rewards perk signs. Like all other rebates, it’s applicable up to 20 gallons. Members must present their fuel rewards card at the time of purchase to have these perks counted towards their savings. 🛍Earn at least 5¢ per gallon Fuel Rewards for every $50 you spend when you shop online: There appears to be an online shopping portal for Fuel Rewards where members can earn bonus Shell rebates if they shop through the portal. Like all other rebates, it’s applicable up to 20 gallons. However, at the time of writing this piece, the link to the portal was inaccessible without a Fuel Rewards account. Just note, in order to receive the rewards mentioned here, you’ll need to log into your rewards first before shopping through the portal. If the portal is similar to most other shopping portals, it will give a selection of online retailers, the bonus amount you will receive in rebates for shopping, as well as the provided link that must be clicked in order to shop, earn your rebate, and complete your online purchase. 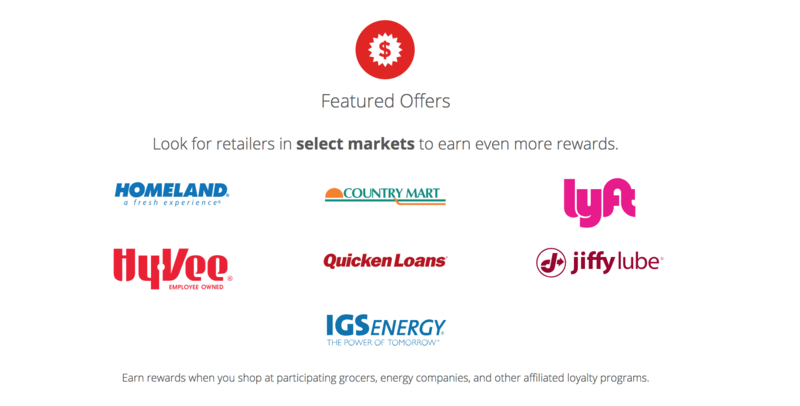 💥Earn Fuel Rewards with “Featured Offers” from popular retailers: Members receive both limited-time and every-day offers through the Fuel Rewards program. In order to access these offers, members are required to log into their account and review the Featured Offers page. Like all other rebates, it’s applicable up to 20 gallons. Offers vary wildly in terms of participating companies as well as rewards received. For example, members can earn 5¢ per gallon Shell rebates at many grocery stores, but there are some limited-time offers that allow earnings of 25¢ up to $1 per gallon. At the time of writing this piece, the higher end rewards included companies like 1-800flowers.com, Winc.com, and Quicken Loans. ⭐️Earn at least 5¢ per gallon Fuel Rewards per $50 spent on linked credit cards at participating merchants: This perk works much like the dining perk; members make purchases at participating retailers with their linked credit card and once a $50 threshold is reached, the member receives 5¢ per gallon back in rebates up to 20 gallon. Again, Shell does not require members to achieve the $50 spend threshold in one purchase; they may make multiple purchases and once the $50 is reached, the award will be distributed. Fuel Rewards are indicating that cardholders earn by making purchases in the appropriate promotional categories. When Shell states, “save [x] cents per gallon”, this is a Fuel Reward. Fuel Rewards are applied at the point of sale. This means, you first swipe your linked credit card at the pump, then you will instantly see the savings reflected as a decrease in the price of the fuel. Fuel Rewards are usually only applied to the first 20 gallons worth of fuel. Additionally, you must use your Fuel Rewards credit card in order to receive these discounts. If, for some reason, the savings are unavailable at the pump, Shell states cardholders will receive the savings in the form of a statement credit, where they will not see a price reduction at the pump rather, but the credit will be automatically posted to the monthly billing statement. Shell Rebates is the term Shell uses to refer to any promotional value that is applied as a “percent back” on your statement. For example, when a promotion states “2% back on dining and groceries”, this is a Shell Rebate. Shell Rebates are automatically redeemed/applied when you make a Shell purchase with your credit card during your subsequent billing cycle. Something to note: Shell also states that it’s possible that a cardholder would be unable to combine multiple discounts, rewards, and/or savings in a single transaction. Meaning, the savings and rebates cardholders earn when they use their Shell Fuel Rewards® Credit Card may not be combined with savings or rewards from any other offer. Unfortunately, this limitation is pretty vague. It’s unclear if they mean that you can’t combine Fuel Rewards and Shell Rewards or if you can’t combine your perks with other Shell promotions. In terms of Fuel Rewards, your rewards will be applied at the pump when you swipe your linked credit card prior to filling up. In terms of Shell Rebates, they will be applied as a percent back on your subsequent billing cycle, but only on purchases made at Shell. There isn’t much management that cardholders need to worry about here. Everything is basically automatically applied either at the pump or to your billing statement. It’s also important to note that you have 12 months from when you earned your rewards to redeem them. Lastly, cardholders should keep in mind that in order to receive the perks, their account must remain open and in good standing. Prospective cardholders can apply for the Shell credit cards online with one application form. Individuals are first considered for the Shell Fuel Rewards Mastercard, and if they do not qualify, they will then be considered for the Shell Fuel Rewards card. Of course, an individual’s approval is based on their creditworthiness and is at the sole discretion of the financial institution backing the card. Neither Shell nor Citibank officially disclose the minimum score needed to qualify for either of these cards. However, most credit card review sites state a “good” credit score is needed to qualify for the Mastercard card and a “fair” score is needed for the other. Keep in mind, this is not an official policy. Remember, if you’re approved for a Shell credit card, you’re automatically enrolled in the Fuel Rewards program and will receive instant Gold Status. 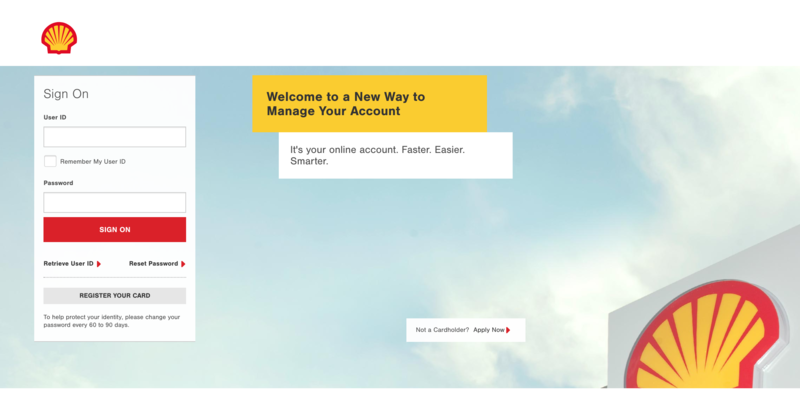 Alternatively, if you’re already a Fuel Rewards member, this existing account will be linked to your new Shell card. At the time of writing this piece, the promotional offer for signing up is to save 30 cents per gallon, up to 20 gallons, on your first 5 fuel purchases. This offer is for individuals who apply by 12/31/19 and is valid on purchases made by 4/30/20. Cardholders can log into and manage their credit card account online via Citibank’s portal. If this is your first time using the platform, you will need to register your card. Once you register, each subsequent visit you can simply sign in with your User ID and Password. If you spend a lot of money on gas and you’re a loyal Shell patron, then it’s probable you could reap some serious benefits from this card if you use it correctly. Especially, if you don’t mind that the rewards can only be used at Shell. If you’re not an avid Shell customer and find yourself filling up at whatever pump is closest when you’re running on fumes, then this card probably isn’t going to be a great fit for you. It’s also not the card for you if you’re worried about a high APR, if you spend more in other categories like groceries and dining, if you want flexible rewards, if you want a card that earns true cash-back, or if you want to earn travel points. In these cases, there are certainly some alternative cards out there, so you get more bang for your buck! Is Shell Fuel Rewards a Credit Card? The Shell Fuel Rewards® Program is a reward program from Shell that functions independently of any credit cards. These two cards add additional savings/perks/promotions to the overarching Fuel Rewards Program. If you are approved for either the cards, you will be automatically enrolled in the general Fuel Rewards program. Does Shell Fuel Rewards Cost Money? No, the Shell Fuel Rewards Program has no cost to sign up. Similarly, neither of the Shell Fuel Rewards Credit Cards require an annual fee. However, basic Fuel Rewards members (non-cardholders) must fill up at least 6 times during the 3-month qualification period in order to maintain their Gold Status; otherwise, they will be downgraded to Silver Status. How Do I Use My Shell Card at the Pump? In order to receive your Fuel Rewards discount, cardholders must swipe their Fuel Rewards card at the pump. The discount is then displayed at the pump so cardholders can see the discounted price prior to filling up. Remember, most Fuel Rewards savings are only eligible on the first 20 gallons, meaning those with larger SUVs and trucks may not receive the perks on the entire tank. This depends on a number of factors. If Shell is the only gas station you use and you drive a lot, then yes, the Fuel Rewards credit cards could be worth it. Remember, the benefits earned can only be utilized at Shell so redemptions are limited. As this is the case, individuals who prefer more flexible rewards or true cash-back may not be satisfied with a Fuel Rewards credit card. This card also won’t be valuable for people who don’t drive very often or fill up at a number of different petrol companies, those who want to earn travel rewards, and those who are nervous about a high APR. 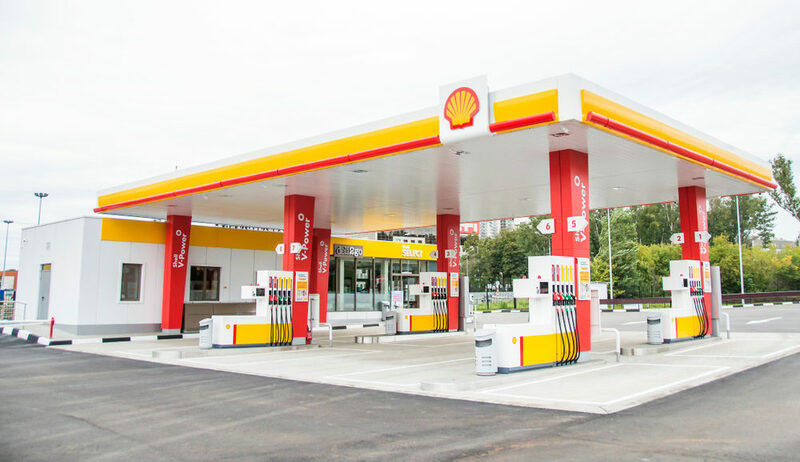 How Do I Redeem My Shell Fuel Rewards? Shell Fuel Rewards are automatically applied at the pump when you swipe your Shell card. Remember, the cents per gallon discount is usually only applicable to the first 20 gallons of gas. Shell Rebates are applied as a percent-back discount to purchases made at Shell in each subsequent billing period.